Only four nonconformists were recorded in 1676. Replying to his bishop in 1706, rector Andrew Glen advised that there were no dissenters in the parish ‘besides one Old Woman & her Son who are Anabaptists. There are 2 or 3 persons who go sometimes to the Presbyterian Meetings but come oftener to church’. There was no meeting house in the parish. Little had changed in 1709. Yet, by the end of the C19th century, there were four thriving chapels and it was even proposed in 1903 that a Free Church council be formed and a united body of non-conformists should withdraw their children from the religious education of church schools. This was proposed by W.Ward (Wesleyan) and seconded by J.E. Tollington (Primitive Methodist). Anther part of passive resistance proposed by the Rev. 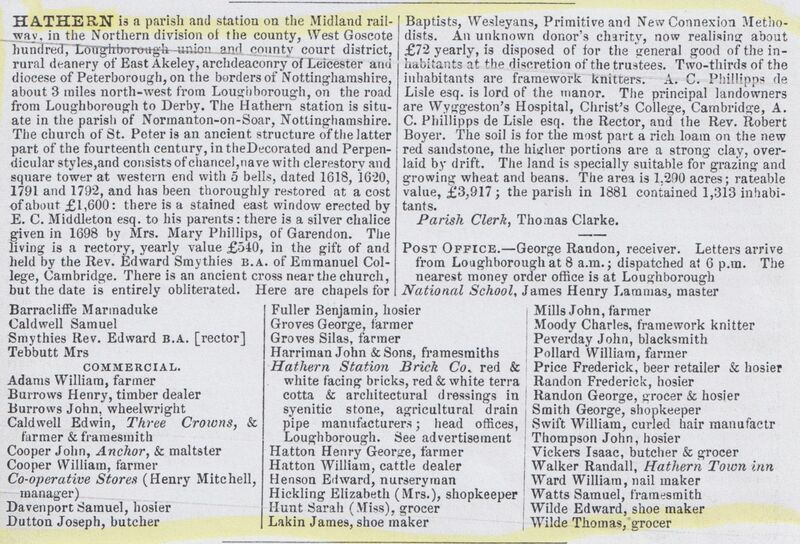 Payne (Baptist minister) was not to pay the education part of the rent. The Primitive Methodist chapel was in in Tanner's Lane. The Primitive Methodists were otherwise called "The Ranters". Elsewhere on this website you can see this and other chapels on O.S. Maps from the late C19th. Picture right is the only only complete picture of the chapel. According to an article in the Christian Messenger of 1911 by the Rev. R.W. Keightley, the Lougborough Circuit, of which Hathern was a part, was one of the oldest in the country. having been formed in 1817. 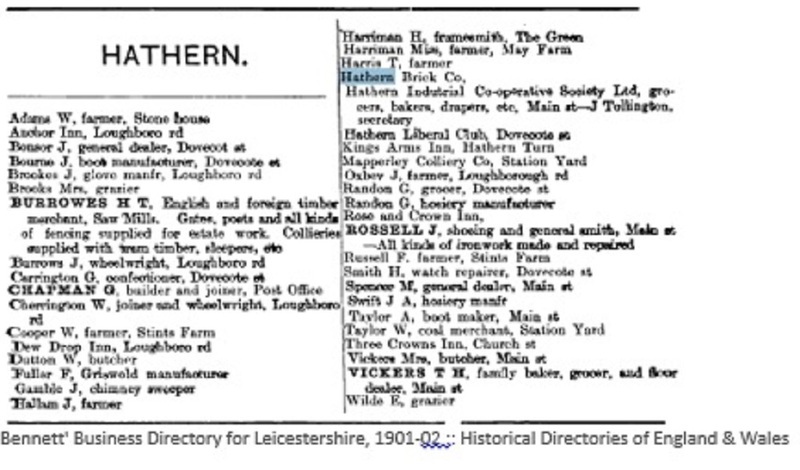 The article described the Hathern branch as follows :- . 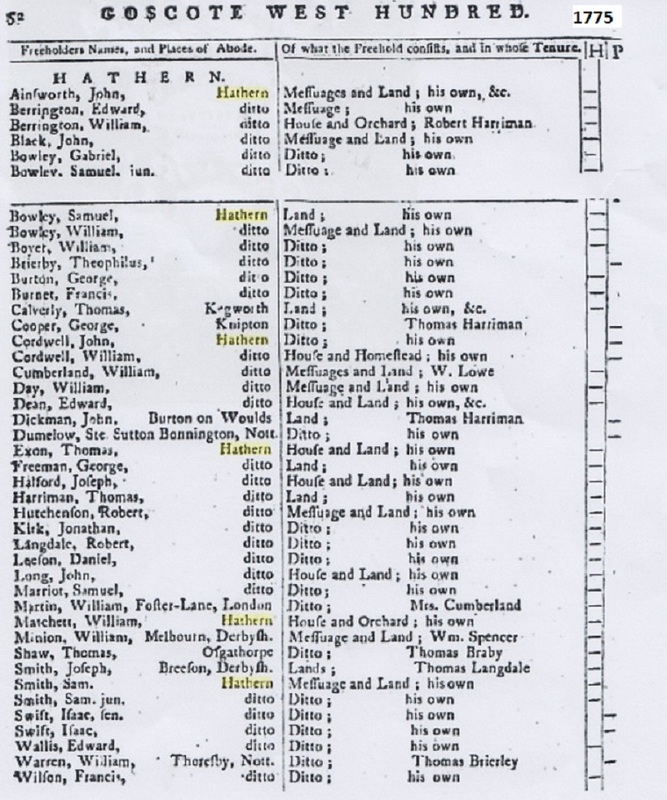 "Hathern did not appear on the Circuit plan until 1842. Here we have a healthy and vigorous church. The chapel was erected in 1842, but a few years ago the interior was modernized, and it is now both beautiful and comfortable. 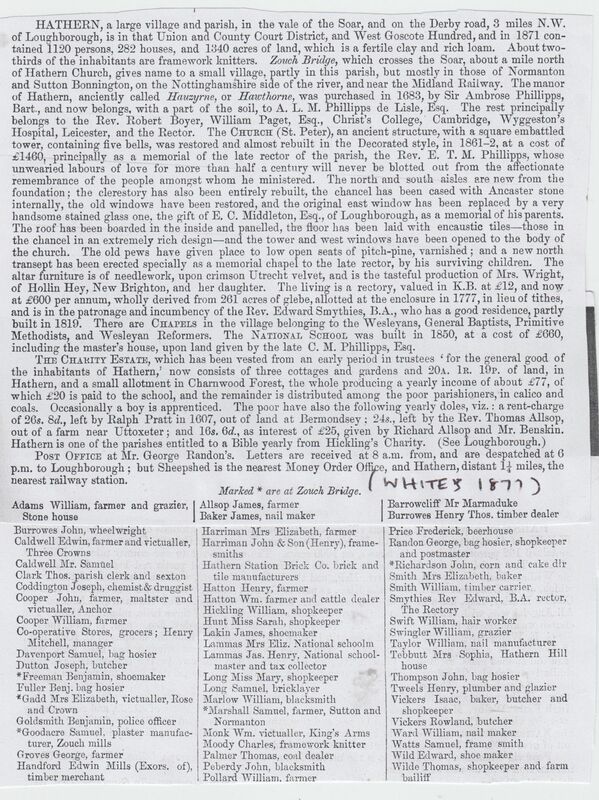 In addition to the chapel there is a good schoolroom, and the Trustees also own a cottage and garden adjoining, the debt upon the whole being only £150. The public services on Sabbaths and week evenings are well attended, and the Class and C.E. meetings are well sustained. Indeed, the members feel that in case of unavoidable absence an explanation is necessary and must be given." 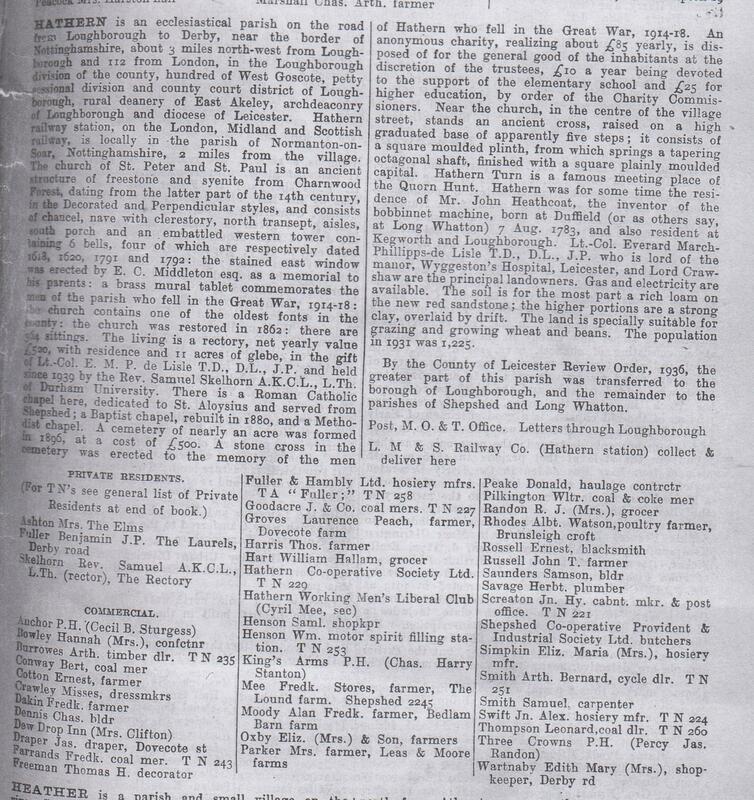 One of the stalwarts in the early days was John Tollington, whose obituary appeared in the Primitive Methodist magazine in 1901. "JOHN TOLLINGTON, of Hathern, in Loughborough Circuit, obeyed the voice, “Come up Hither," on the 17th May, 1899, leaving a record worthy of emulation. He was for fifty years a member, and during forty-two years the class-leader and superintendent of the Sabbath School, and as such exemplified many laudable qualities, some of which stood out with well-defined distinctness. His religion was steadfast. His faith rested on Christ; it was like the lighthouse built on and in the rock, from which he could not be seduced by the music of the syren, nor washed by the waves of persecution. His religion was unobtrusive. Though never forcing himself or his religion on the attention of others, when occasion required he was unflinching in his avowal of Christian discipleship, and shrunk not from the profession of his union with Primitive Methodism. His affliction was prolonged. It was paralysis; for several years partial, for several months entire. His affliction was mitigated. In helplessness the loving attention of a devoted wife and other relatives (who are comforted by the hope of a re-union), did much to relieve his sufferings, but there were assuagements transcending the earthly. Celestial dew-drops fell about his bed. Odours from the field of paradise were wafted into his room. He had believed in angelic ministration, now it was realised. To mellow the breath of prayer. 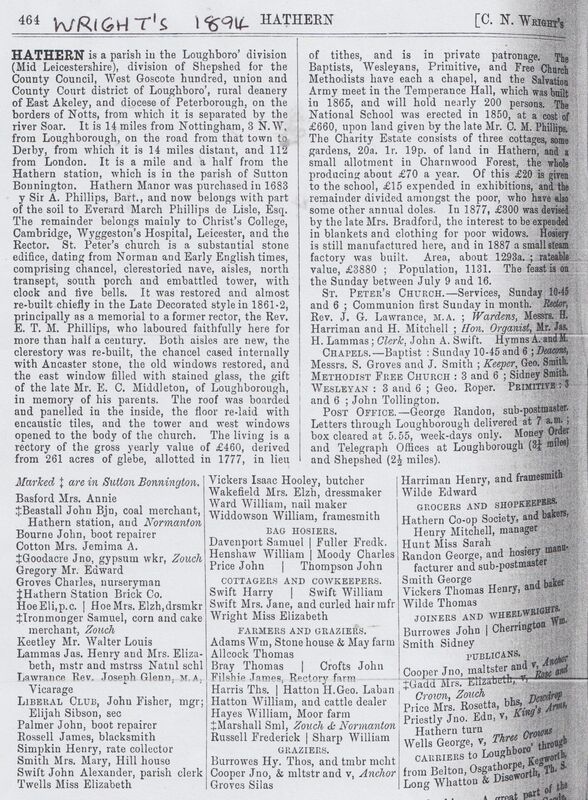 John was born abt 1825 at Hathern, Leicestershire. 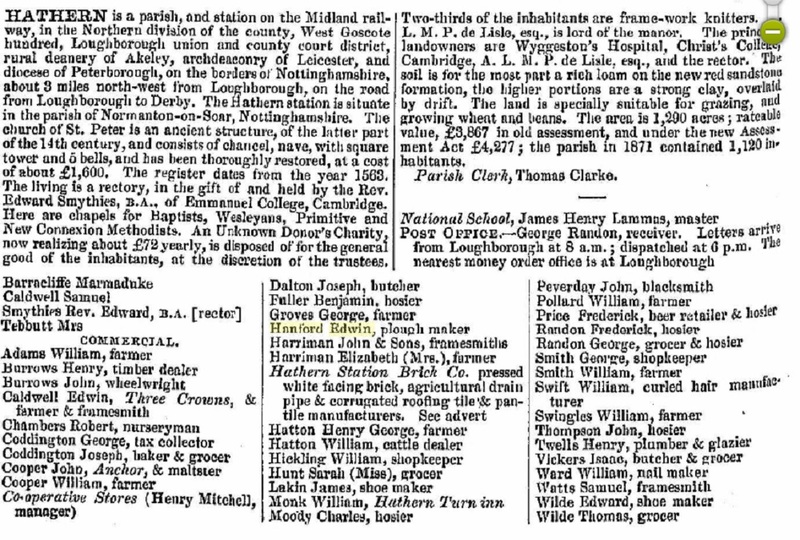 He worked as a frame-work knitter and his house was in Tanner’s Lane. .
John married Ann Bowley, framework knitter (1826-1852) on 5 December 1844 at Hathern, Leicestershire. Census returns identify three children. John E.(1846-1927) - a frame-work knitter living in Victoria terrace on Narrow Lane. 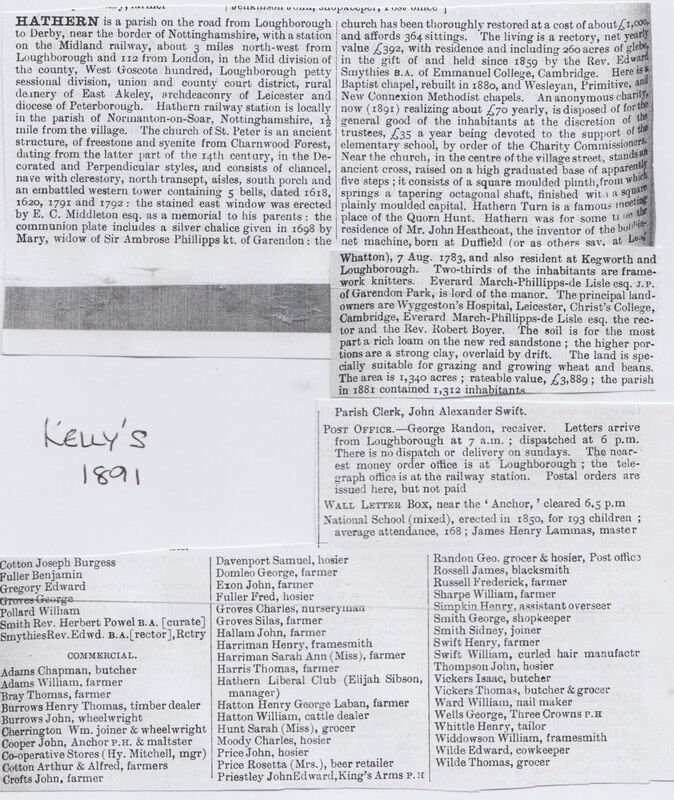 This is the bearded man shown on the photo - he was the first secretary of the newly-formed Hathern Liberal Club and he and his wife were also active members of the church. 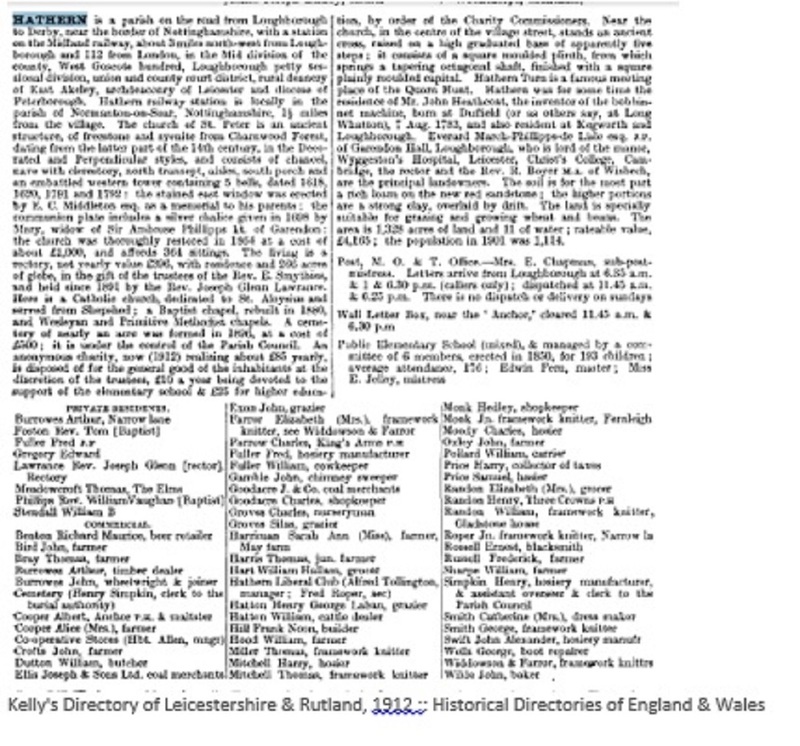 John married Sarah Exon (abt1832-1913) in the summer of 1856 in the Loughborough Registration District, Leicestershire. Census returns identify two children. Joseph Exon (1857-1922) - a frame-work knitter (1911). Mary Jane (1864-1886) – dressmaker. 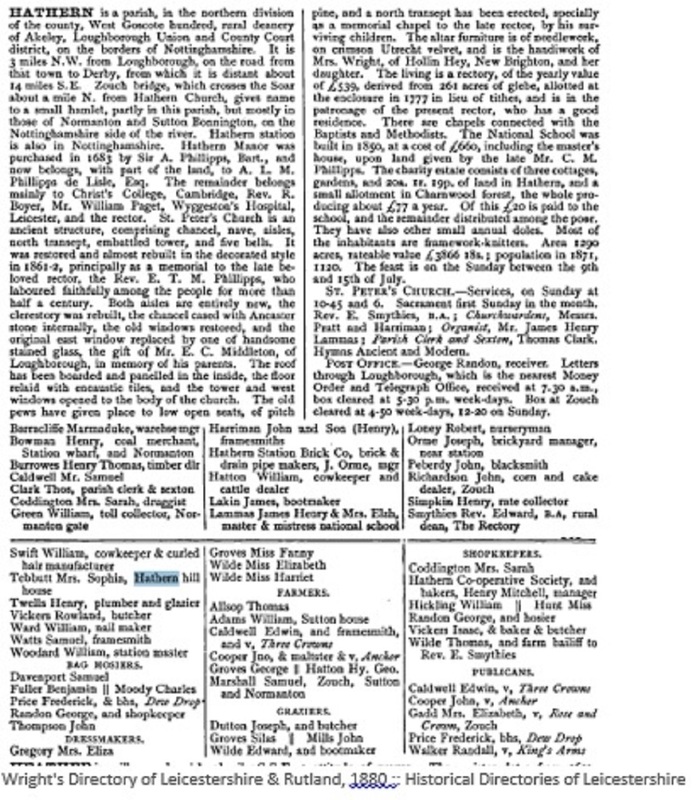 Newspaper reports on the Primitive Methodists :-. The first ref. 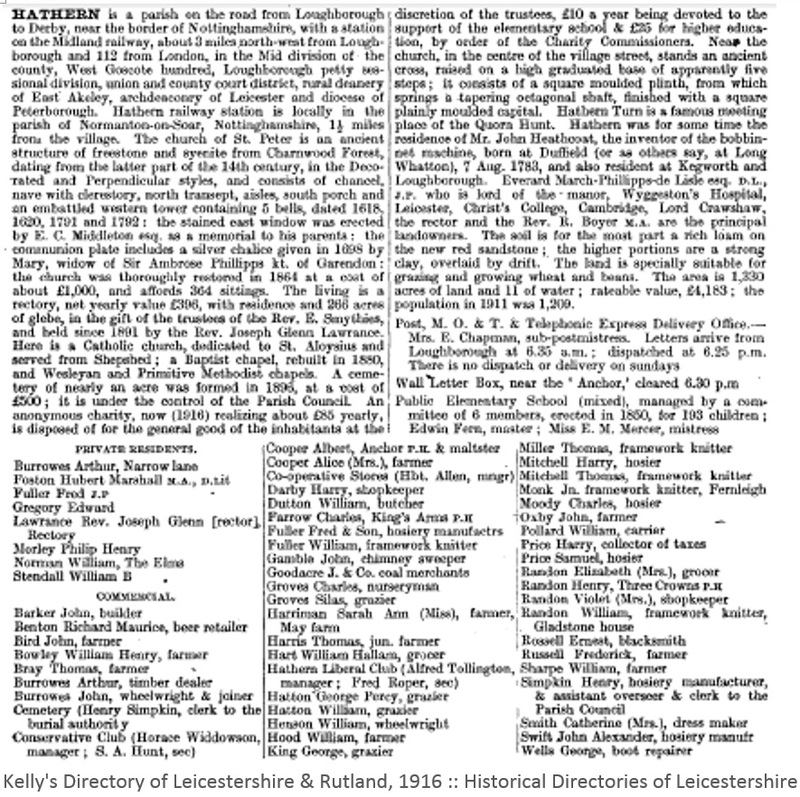 to Primitive Methodists in Hathern seems to be Aug 25th 1860 in the Leicester Guardian when it was reported that there was a tea meeting after which the Rev. Boden delivered a lecture on "The bible". One of the most unusual ceremonies held in the church was the wedding of eighty year old Richard Cheatle to Ann Ratcliffe thirty-five years his junior, an event of immense interest to the village. 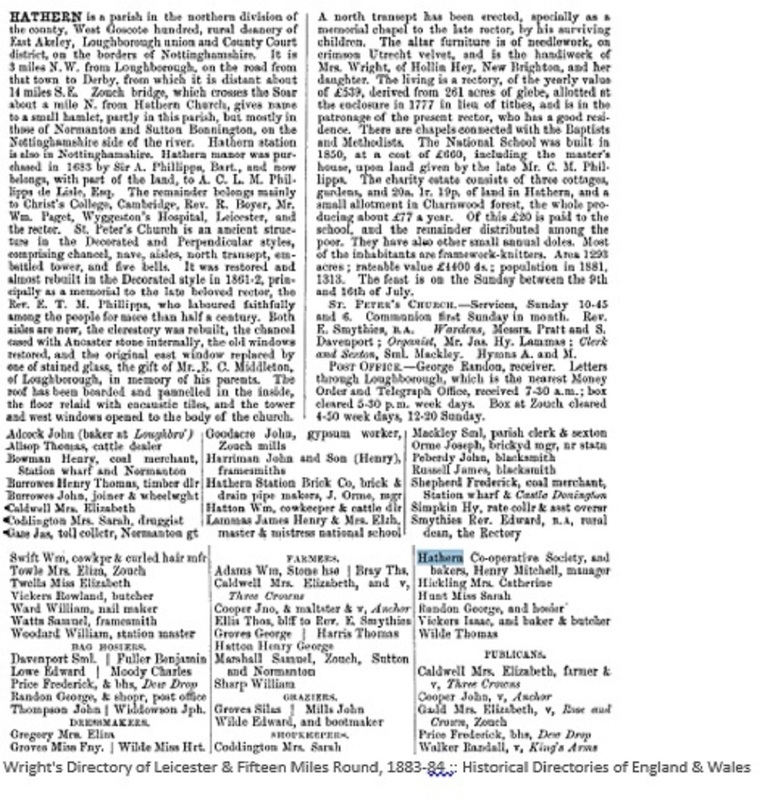 Following is the report in the Leicester Journal of June 2nd 1863. "The quiet village of Hathern, was all in commotion on Tuesday, on the occasion of two of its notabilities, Richard Cheatle and Ann Ratcliffe, being united in the bonds of Hymen. The bridegroom, who has withstood the piercing effects of more than 80 winters, appeared as gay as a " four year old," wearing a rosette of coloured worsted large as an ordinary cauliflower. The bride elect of 45 summers, having cast away her widow's weeds, was suitably attired, topped with a white lace fall and holding a bouquet of green box, stuck through a piece of old manuscript which had lost its whiteness to the ravages of time. The neighbours determined to celebrate the nuptials of a pair so admirably suited for each other, except as for age, and a subscription was set on foot, with a committee of management to carry out the arrangements. A conveyance was procured, which with the horse, was profusely decorated with evergreens, carrying a blue flag, and the bridal party took their seats about nine o'clock, proceeding to the Primitive Methodist Chapel, where they were made one. Many of the villagers followed, and on their return they were met at Dishley Mill by the Hathern band, and a host of their neighbours, where a procession was formed. About forty young men and old, a kind of advance guard, bore boughs of oak over their shoulders, headed by a man in military costume, with a painted face, and playing upon a penny trumpet, the band playing very appropriate airs on the way, and a number of boys beating time with their cymbals. When they reached the village they were joined by an immense number, and paraded the town, stopping at the various public houses to celebrate the event in ideep potations, till they became " more merry than wise." It was estimated that the number assembled on this extraordinary occasion could not be less than 1000 persons (it was pity that they had nothing better to do), and the event will be long remembered those who witnessed the proceedings". 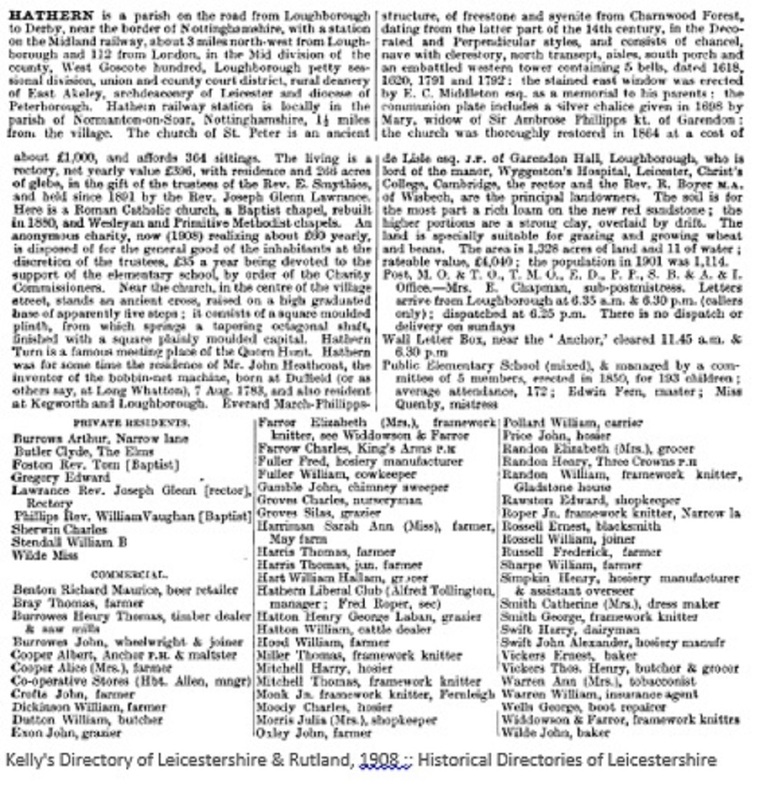 A more typical event was reported on August 26th 1887 in the Leicester Journal- a public tea in the schoolroom followed by a sale of clothing for the chapel trust fund and later a sermon entitled "Ray of Light ; or, obscure Bible Words". 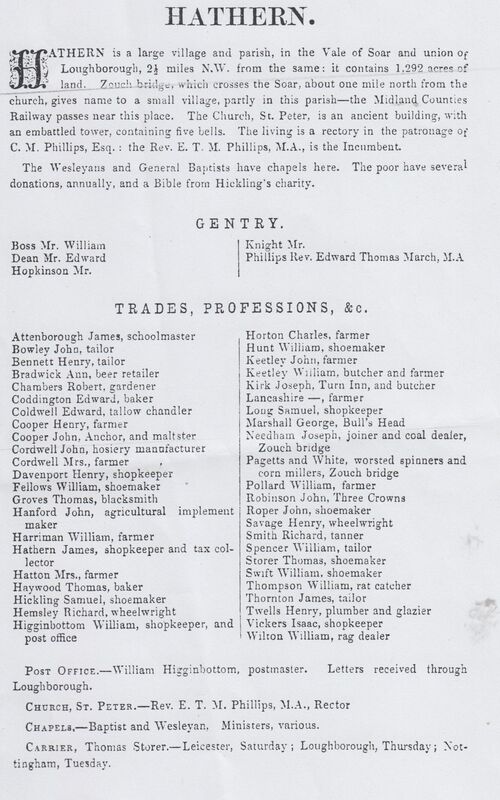 There was a fair attendance and the chair was taken by Mr. Henry Harriman. 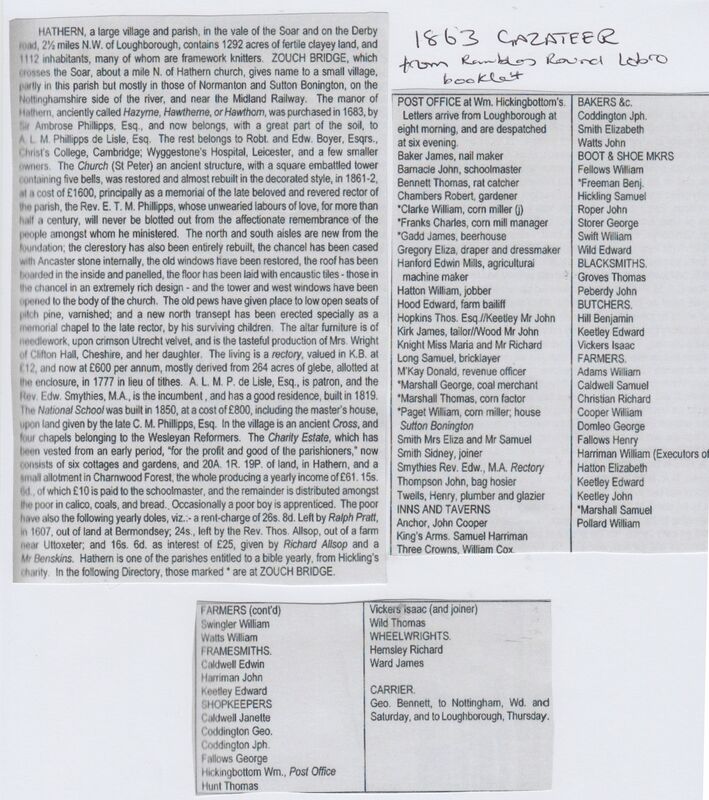 You can see many other such events and other reports in our newspaper archive. Below you can see the Loughborough Circuit schedule for the first quarter of 1918. The preacher from each chapel would tour the chapels. 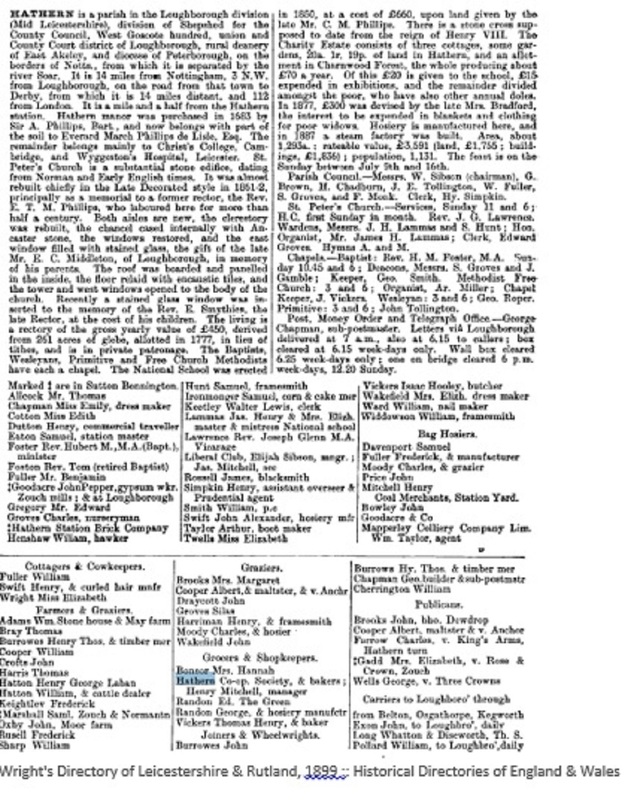 The preacher from Hathern is named as W. Warren (Number 18) and you can see that he only preached in Hathern for one of the thirteen weeks. The steward of Hathern is the J. E. Tollington described above. The chapel continued in use up to its demolition in the 1960s. The picture below (which is also on our events gallery), is of a May Day parade in the 1950s. You can see the chapel at the bottom of the aerial photo below. The caretaker then was Esther Brown.